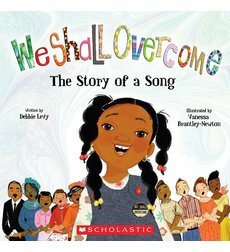 This picture book is about the power of a song to make a change. The book starts with discussing slavery and goes through singing the song in church, on the streets, in marches, across states, at home, in Africa, across the globe, up until our present time when Obama got elected as President. This book shows where the song started and all the places and people it touched. All of these people and places took action to sing this song and protest for their rights, and even the rights of others. The book ends with a very strong message, that people are still struggling against freedom, poverty, fairness, etc. and that we will all overcome. It states that everyone is a human being and should be treated equally and with respect. There is also a timeline at the end of the book that shows different points in time and how people singing this song brought upon change. This book specifically targets social change in regards to the song that was created and sung as a statement. Element 6 involves taking a stand about something you believe in, to better the world and the community you live in. The creation of this so powerful that it started a movement, which resulted in social action against the government and people who believed in segregation. The end of the novel shows the results of the song and how taking action created positive change in our society. A black president was elected as a result of African Americans taking action against the government and powerful white people. The book even states that we need to have the mindset that everyone is human therefore everyone should be respected because there are still individuals suffering. If those individuals begin to take action, then they will create change. I would first start by having a shared reading in my classroom. The pictures and the way the book is written are interesting and will engage my students. I will then have each student reflect on a point in their life where they have stood up for what they believe in or have witnessed someone take action. They will then draw a picture about the situation they described and writing only a few sentences to describe their picture. In one sentence under the description, they must write one thing that they will take action against at home or in their community. I will make sure to include examples such as taking action and recycling, conserving water, etc. These will be displayed outside the classroom, with the title of the book above all the pictures. My hopes for this activity is for students passing by or in other classrooms can notice simple ways we can take action, and encourage them to take social action for something they strongly believe in. For other activities, reference this link as aguide!